Over the last decade, New York City has received a lot of attention for their redesigned pedestrian plazas. That’s because they’ve turned once unwalkable and wasted spaces into beautiful stretches of open space where locals can go for a leisurely stroll, gather with friends and simply enjoy the magnificent city. Plus, these spaces are far safer than they were in the past thanks to their ingenious designs. At TerraCast Products, we are proud to share our planters, lighting fixtures and site furnishings are used in many of the pedestrian plaza redesigns throughout NYC. 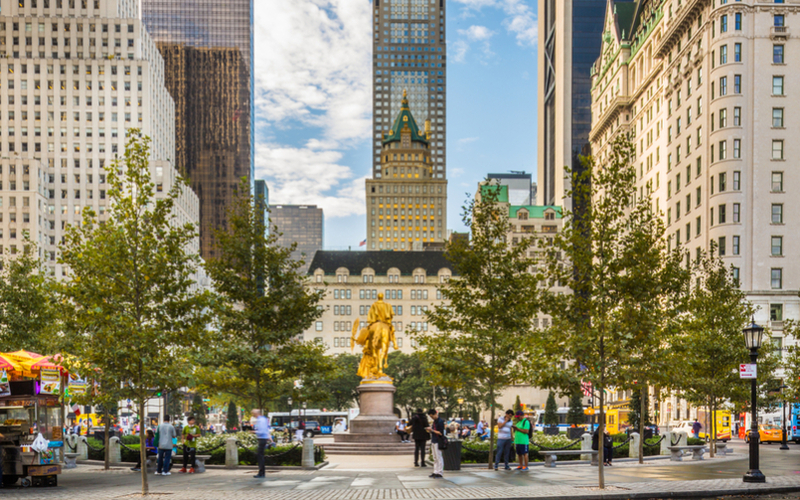 Here’s a rundown of many of the different Pedestrian Plazas found throughout New York City, all of which are worth taking inspiration from. Once an unnoteworthy stretch of road, the Bogardus Plaza is now a lively place to hang out, ride scooters, or sit back with a hot cup of coffee and the weekend newspaper. What began as a temporary plaza, has now become a permanent part of the city when it was adopted by DOT’s Plaza Program in 2013. The plaza is maintained by Friends of Bogardus Garden. Years ago, this road was blocked off to non-emergency traffic. Since then, even more has changed – including the development of a pedestrian plaza. 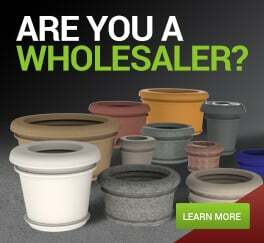 The site features potted plants and portable furniture. The plaza is viewed as a victory for the nearby university, as well as the homes in the area. No cars may pass through this stretch of space that runs from 35th Street to 41st Street. Tables and chairs along with public art installations now line the area. The Chelsea Improvement Company manages this pedestrian plaza, which is adorned with tables, chairs, and umbrellas to help escape the heat, or the rain. The plaza also offers free Wi-Fi to encourage people to hang out longer. Developed in 2008 as a way to reduce traffic, Gansevoort Plaza is a collection of pedestrian areas that begin on Gansevoort Street, moving up to Ninth Avenue and 14th Street, where it collides with Chelsea Plaza. The plaza is covered in decorative concrete pavers and adorned with chairs, tables, and umbrellas. Planters add some greenery to the space. This plaza originated in 2008 and continues to host fun community events and attractions, including the popular Madison Square Eats. The famous Herald Square is adorned in planters and offers seating near some of the best shopping in the city. A number of events are routinely held here, including classes. It’s no wonder this plaza is always buzzing with people. This is not a new pedestrian plaza. In fact, this plaza originated in 1978 and was the first plaza dedicated to an artist, as well as a woman. Sculptor Louise Nevelson’s iconic artwork Shadows and Flags remains a prominent feature in the plaza. This plaza is unique in that it is not a repurposed roadway. It wraps around the rear-end of the Manhattan Municipal Building and is home to a variety of food vendors with causal seating. Yet another plaza near and dear to our hearts, Times Square features TerraCast planters, plenty of seating, and it even has phone chargers. This is the largest and grandest pedestrian plaza of them all. This is one of the newer pedestrian plazas in NYC. It is located near Penn Station. The goal of this plaza was to reduce the “awfulness” of being near the train station. It’s covered in greenery and artwork and considered a success. Wi-Fi, food, lots of seating, regular farmer’s markets – this spacious 27,000 square foot plaza has it all going on. It even features a mini golf course! Situated on the edge of Manhattan, this car-free sanctuary is a great place to relax and watch the crowds come and go. It includes all the standard fixings of a great pedestrian plaza, including chairs, tables, and free Wi-Fi. Developed in 2012, Fowler Square is a people-friendly space that wraps around a fountain filled with plants with a statue at the center. Situated at the entrance to the Manhattan Bridge, this plaza is smaller and only includes a few benches. Opened in June of 2015, Fox Square is a repurposed triangle that includes several benches and pretty plants. An extension of an existing triangle, New Lots Plaza opened in 2011 to create a safer space for people to gather beneath the elevated subway tracks. This was once a parking lot, but today it’s a far more functional space with chairs, tables, plants, and plenty of food trucks.